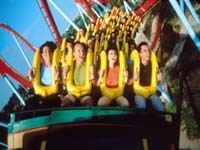 This massive theme park, based on Busch Gardens in Florida, attracts holidaymakers from far afield to its 'Five Worlds' (Far West, Mediterránia, Mexico, China and Polynesia). There is now also a new children's section with a Sesame Street theme. Visitors can be at the Great Wall of China one minute and at the ruins of Mayan Mexico the next, and meet some cowboys for a taste of the Far West before cooling off by jumping into the great lake from the summit of the Tutuki Splash Volcano. Popular attractions include the Sea Odyssey underwater adventure, the Stampida roller coaster ride and the Grand Canyon Rapids water ride. The Shambhala ride, in the China section, is said to be the tallest and fastest ride in Europe and is guaranteed to thrill! The park is enormous and is part of a resort complex which also includes a water park, four hotels and a convention centre. Apart from numerous rides and restaurants, there are many shows and entertainment options at PortAventura. It takes much more than a day to experience everything, particularly if you want to visit the water park as well (combination tickets are available), and many visitors opt to spend a night or two at the resort. Some of the snack kiosks and entertainment venues do close outside of the summer months. Admission: There are numerous ticket options and online specials which change frequently. Check the official website for details.